When it comes to mercury contamination of seafood, scientists and environmentalists ring the alarm, warning consumers that eating too much fish can expose the body to toxic amounts of mercury. When it comes to mercury in vaccines, however, it’s a much different story. Scientists often ignore the fact that children and adults are routinely injected with thimerosal, a mercury derivative used in flu shots. ICP-MS testing recorded mercury in the FluLaval vaccine at a disturbing 51 parts per million, which is 100 times higher than the mercury level often measured in contaminated fish! Why aren’t scientists raising the alarm when it comes to flu shots? To make matters worse, this mercury is injected directly into the bloodstream, bypassing the body’s natural filters in the gastrointestinal tract. A direct injection of mercury at this level is very capable of damaging the nervous system. Having a hard time sleeping, thinking or remembering? This is not a sign of getting old. 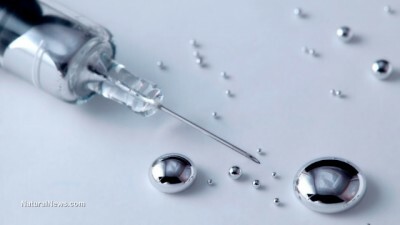 Your mind may have been poisoned by modern medicine (injections of mercury). Even more disturbing is that we, as a society, are injecting this toxic element into our children, who are not even fully developed. How might mercury injections stunt a child’s ability to learn? How might this potent element elicit behavioral and attention problems in children? How might mercury turn our immune system against us? Researchers at the University of Michigan are finding out that even “safe” low doses of mercury are capable of eliciting autoimmune disease among women of childbearing age. An autoimmunity disorder is where the body’s own immune system starts to attack healthy cells instead of fighting off invading pathogens. This self-destructive condition affects nearly 50 million Americans today and includes autoimmune diseases such as lupus, Sjogren’s syndrome, rheumatoid arthritis, multiple sclerosis and inflammatory bowel disease. Previous studies have tried to blame genetic makeup as the cause, but the more scientists look into epigenetics and the role of the microbiome in influencing genes, the more they realize how environmental pollutants like mercury do the damage, turning the immune system against itself. “A large number of cases are not explained by genetics, so we believe studying environmental factors will help us understand why autoimmunity happens and how we may be able to intervene to improve health outcomes. In our study, exposure to mercury stood out as the main risk factor for autoimmunity,” said lead author Emily Somers, Ph.D., Sc.M, at the University of Michigan. Somers analyzed data from the National Health and Nutrition Examination Survey from 1999-2004 for women ages 16-49. The higher amounts of dietary mercury in seafood were linked to higher incidence of autoimmune disease. The more mercury a woman consumed, the more likely her body would create “autoantibodies,” which are the precursor to autoimmune diseases. Under the influence of mercury, a person’s immune system loses its ability to differentiate between its own healthy cells and harmful invaders. In this confusion, the body creates special proteins called autoantibodies. “For women of childbearing age, who are at particular risk of developing this type of disease, it may be especially important to keep track of seafood consumption,” said Somers. The US FDA and the EPA concur that pregnant women should not eat more than 340 grams or 12 ounces of seafood in a week. Too much bio-accumulated mercury from seafood puts the human immune system at risk, especially if it is not detoxified from the body appropriately. Seafood like king mackerel, swordfish, tuna, tilefish and shrimp all contain mercury. If the mercury is not being properly filtered by the body’s gastrointestinal tract with the assistance of detoxifying foods, then mercury’s damage will be even greater on the body, confusing the immune system to create autoantibodies that attack healthy cells. In the case of flu shots, the damage of mercury is more catastrophic because it is injected straight into the blood like a snake bite, where it can reach vital organs faster, without being properly filtered. This study warns about overconsumption of mercury in seafood, but does not warn consumers of the dangers of injecting mercury directly into pregnant women and children. Why aren’t flu vaccines like FluLaval being pulled from the market immediately and being declared poisonous substances that do harm to all, especially women and children?